What's an adventure... without a little treasure? But the set has sixteen pins, so eight chaser pins have yet to be revealed! We've been having fun predicting what the chasers might be in another thread, but Merlin and I thought, Why not make things a little more interesting? Guess the "Love is..." Chaser Contest!! Rules are as follows. Please read carefully before submitting an entry. 1. Each DPFer can submit one entry, so think carefully! 2. Each entry should include two characters and a tagline. Your entry must take this form: Character 1/Character 2: Love is... (e.g., Princess Banana/Prince Peach: Love is a Toaster). 3. Each entry must be original. No duplicate entries. The first person to enter a pairing and tagline gets that entry. Because of this, no editing posts. If you edit your post, your entry may be disqualified. The second post of this thread will have a running list of entries. 4. You can submit the same pairing as someone else, but your tagline must be significantly different (with Merlin and I as the arbiters of significantly--we're word nerds, so you're in good hands ). If one person enters Princess Banana/Prince Peach: Love is a Toaster and you enter Princess Banana/Prince Peach: Love is a Cat, you're probably good. If you submit Princess Banana/Prince Peach: Love is Toasted, we may call foul. If your entry is denied on this basis, we will let you submit another entry in a new post. 5. You must post in this thread to enter. PMs don't count. Posts on Merlin's prediction thread also don't count. That said, please don't go to that thread and poach ideas. We won't police it, but this is meant to be a fun activity, so please participate in the spirit of community. Entries must be posted by 11:59 p.m. WDW time (Eastern) on August 23. So when the clock strikes 12 in the wee hours of the first registration day, this contest is closed. (Hopefully we don't have any early scrappers!) Winners will be announced the week after the event. You must correctly guess two characters and the tagline. The tagline wording does not have to be exact but must be very, very close (again Merlin and I will judge). If the pin has more than two characters and you have at least two right, you still win. A small box of treats and Disney goodies put together by Merlin and me! Since there are eight chasers, we have the potential for eight winners! What if nobody guesses a full entry correctly? 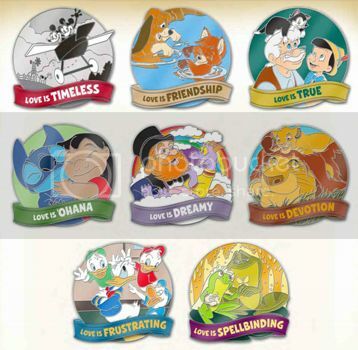 If nobody gets both the pairing and the tagline correct for any of the pins, we'll pick winners based on whoever got characters right and got closest to the spirit of the tagline. If anyone has additional questions that need to be addressed to the whole group, I'll answer them here. Hercules and Pegasus - Love is Strong! Cinderella/Prince Charming - Love is a Ball! Your entry is secure with Darkwing Duck/Launchpad McQuack. Since you submitted this before I added the rule, I'll let you change it to Darkwing/Goslin if you want. Jack/Sally: Love is meant to be. i will leave it as LP ... but it would also be cool with Goslin. It so would. I don't think there are any pins of her! Merida and momma bear love is brave! I'm so excited to see all of the entries! good luck, everyone! And thank you, Kim for putting this together! I propose Marlin and Nemo. Love is a Journey!